NOTE: shorting the power-on pads might not work if the keyboard still connected to the motherboard. If it doesn’t work, unplug the keyboard cable from the motherboard and try again. Sometimes it takes a few attempts to make it work. 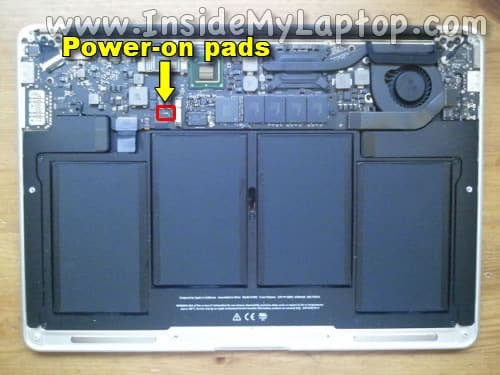 In this post I’ll show you how to locate the power-on pads on different Apple laptops. The location depends on the model (year). You can find the model using the serial number. Locate the serial number printed on the bottom cover and enter it in the search tech specs box (click on Browse by Product button first). I’ll be adding more pictures as I get access to other models. In this model the power-on pads look like two solder terminals and located right above the touchpad cable. In this model the power-on pads located above the left side of the keyboard connector. The power-on pads located right above the left side of the keyboard connector on the motherboard. Two square terminals positioned vertically. 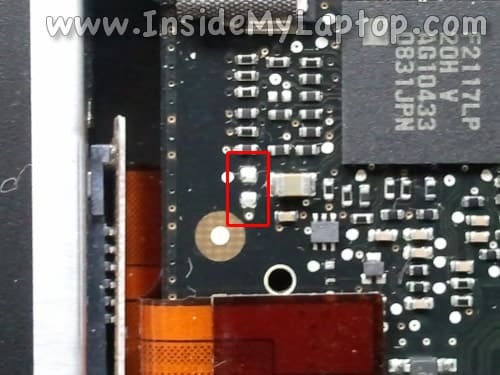 In this MacBook Air the power-on pads located right above the keyboard connector. In this MBA the power-on pads located just above the right side of the keyboard connector. In this MBA 13-inch the power-on pads located right above the keyboard connector. 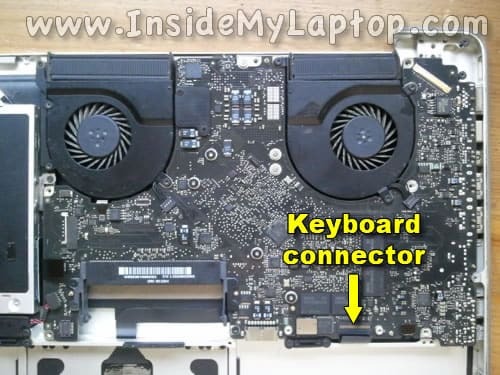 In this MBP the power-on pads located between the trackpad connector and hard drive connector. On the following picture I disconnected the hard drive cable so you can see the power-on pads better. You still should be able to short them with a small flathead screwdriver even without disconnecting the cable. I guess that MBP (13-inch, Mid 2009) have two different logic boards. They are similar but power-on pads located in a different spot. Take a look at the following two pictures. The power-on pads located on the right side from the hard drive cable. On the following picture the hard drive cable disconnected so you can see the pads. In this model the power-on pads look like two silver squares and located above the keyboard connector on the left side from the square chip. In this model the power-on pads located on the upper side of the motherboard, on the right side from the screw mounting hole. Here’s a shot of the MacBook Pro 13″ Mid 2012 logic board power on pads. These pads are located to the left of the memory slots and above a silk screened “HF/e1” on the logic board. The power-on pads are shiny, silver, square, and larger than the other (mostly round) silver pads nearby. This MBP has power-on pads located on the left side of the motherboard, right above the optical drive cable connector. They look like two square solder terminals positioned vertically. This motherboard DOESN’T HAVE the power-on pads. 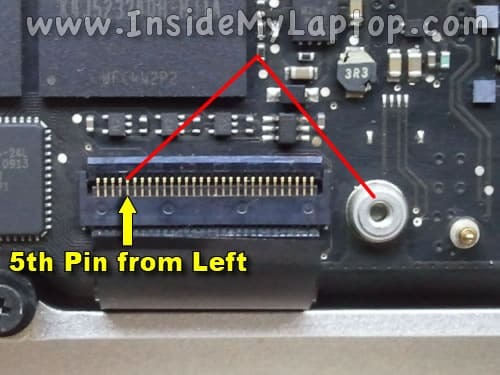 In order to turn on the laptop you’ll have to short the 5th pin from the left side of the keyboard connector to the ground (a metal stud on the motherboard). Be careful! Do not short other pins. In this model the power-on pads located on the lower part of the motherboard. In this model the power-on pads located right above the keyboard/trackpad connector shield. 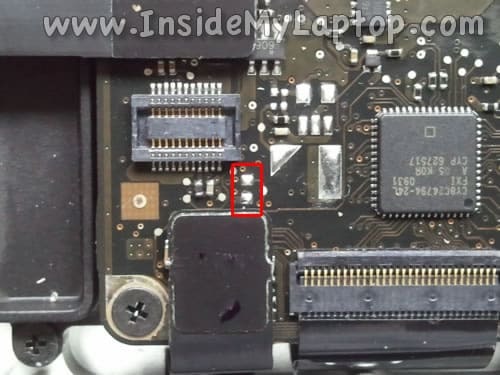 Here’s a close-up picture with the keyboard/trackpad connector shield removed. The power-on pads look like two solder terminals and located above the trackpad connector. 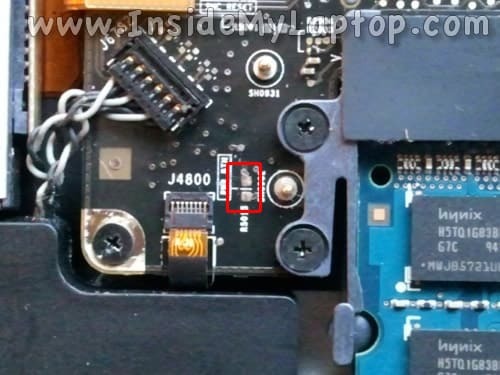 In this model the power-on pads also located right above the keyboard/trackpad connector shield but positioned vertically. The pads look like two square solder terminals and located above the keyboard connector. On this motherboard the pads located on the left side for the AirPort board. Here’s a close up picture. In this model the power-on pads located on the left side from the memory slot and marked R5015. 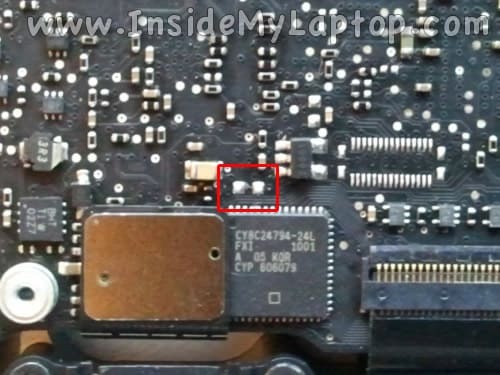 On this logic board the pads located in the lower left corner, on the right side to the mounting screw. On this motherboard the power-on pads located horizontally, on the left side from the square SMC chip (the larges square chip on the picture). If your keyboard failed you’ll have to replace it with a new one. 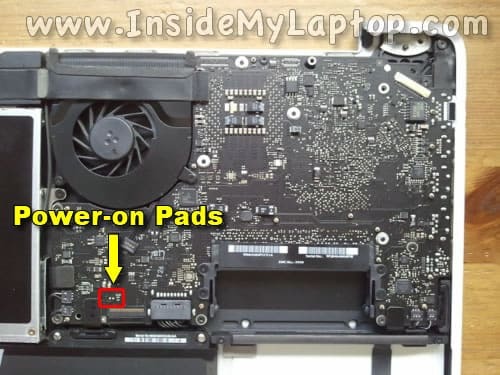 Here’s how to replace keyboard on a MacBook Pro 13″, 15″ and 17″ unibody laptops. You are correct. Fixed. Thank you! Just added pictures for MacBook Pro (13-inch, Mid 2009). Just added pictures for MacBook Air (13-inch, Mid 2012). I just found out that a MacBook Pro 17-inch early 2009 has the power-on pads in the same location as a Mid 2009 model. Updated the post. 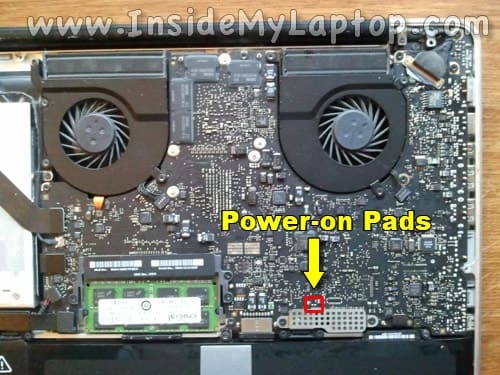 Where’s the power on pads for a MacBook Pro 13 inch mid 2012? I don’t know yet. I’ve been looking for the power-on pads location on this model for myself but couldn’t find it. I’ll definitely post a picture as soon as I find the location. Just added pictures for MacBook Air (11-inch, Late 2010). Is there any other way you can turn on a MacBook? Because mine was working fine, but when it ran out of batteries and shutdown, I couldn’t turn it back on again with the power button. It’s fully charged right now, and I tried everything I could find online. I took it to a tech today and he said I had to replace the logic board, which is so expensive! What are signs of a broken logic board? Thank you! Is there any other way you can turn on a MacBook? Because mine was working fine, but when it ran out of batteries and shutdown, I couldn’t turn it back on again with the power button. It’s fully charged right now, and I tried everything I could find online. I took it to a tech today and he said I had to replace the logic board, which is so expensive! What happens when you push on the power button? Any activity? Chime sound? Here’s what you can try. 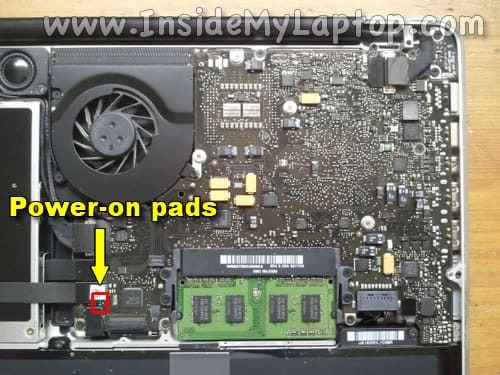 Remove both memory modules and try turning it on and look at the light on the front of the laptop. Does it blink when the memory is removed? What are signs of a broken logic board? There are lots of them. 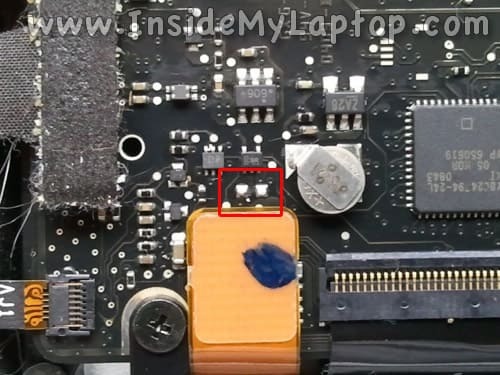 The logic board might look completely normal but the laptop will not turn on, will not run on the battery power, will shut down intermittently, etc…. This is great, exactly what I need for my diagnosis. BUT, I have a MacBook Air 13″, model late 2010, and the internals look different from any of the above. Can you please help me out? Many many thanks. Best. (Tip: rename title of article more generic). 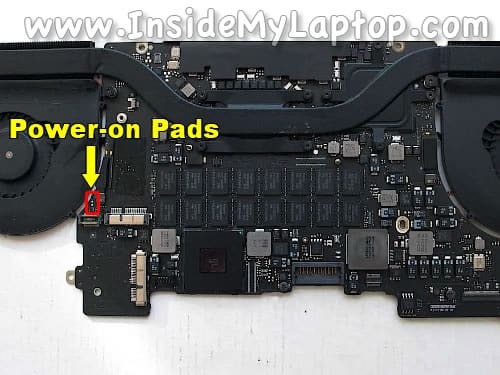 Found the answer myself 🙂 it’s the bottom (smaller) two pads, left-below the trackpad/keyboard connector, when batteries are turned downwards. Best! I have a MacBook Air 13″, model late 2010, and the internals look different from any of the above. 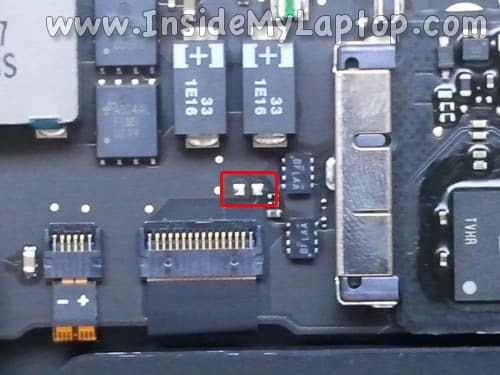 Can you please help me out?…Found the answer myself it’s the bottom (smaller) two pads, left-below the trackpad/keyboard connector, when batteries are turned downwards. Best! I’ll add this model to my post when I have a chance to take a picture of the motherboard. Just added pictures for MacBook Air (13-inch, Mid 2011). HP Presario CQ61 laptop doesn’t have power-on pads like Mac laptops. If you suspect the power button failed, you can try replacing the power button board. Here’s service manual for this laptop. The manual has step-by-step disassembly instructions. You can find a new replacement power button board on eBay. Great work, God bless you! Spilled some white wine on trackpad & lower keys area, wiped up asap, keyboard went dead on most letters after a while but I shut it down unfortunately and now PB does not work. Your page “Turning on MBP without pb” (mine is MBP 15′ mid-2010) says that if the short does not work the first time on the power pads you need to disconnect the KB from MB. How do you do that without taking the whole thing apart (battery, HD, fans etc.)? I guess they have to be in in order for the MBP to boot, right? I’d like to use the MBP until the new KB comes in, I have an external USB I can use and mouse worked fine before shut down. Pleas help and thanks a million! and disconnected it (battery needs to be removed for easy access). It would not work otherwise and when I connected it back to MB it actually shut down the MBP, so definitely the KB assembly is busted and shorts somewhere. The trick in my case (mid-2010, 2.66Ghz i7, Unibody A1286 format) was to connect the MagSafe back on after shorting the power pads (while holding it upright on its side, cover slightly open so it boots) and bingo, it turned it on and is working fine with Apple’s alum. external KB and BT mouse. Now, where is best place online to get a KB replacement only… anybody knows? I’m buying them on eBay. Just search for the laptop model and year (for example MacBook Pro 15 mid 2010 keyboard). It’s not expensive. A new keyboard with backlight will cost about $30-40. Before you buy a new keyboard make sure it’s the right one. Compare it to your keyboard and make sure the keyboard cable located in the same spot. I did a mistake once and purchased completely wrong keyboard. Make sure to buy it from a reputable seller with many positive reviews. Thank you for the wonderful site. I have a Macbook Air 11″ Late 2011, and the logic board looks quite different from your photo of the Air 11″ 2010 model. I can’t find any pads near the keyboard connector. I need to boot the logic board without the keyboard and would be very grateful for any help. Hi, I have a problem with a early 2008 15 inch macbook pro. I don’t know where the power-on pads are. Can you help me identify them? I have a problem with a early 2008 15 inch macbook pro. I don’t know where the power-on pads are. Can you help me identify them? 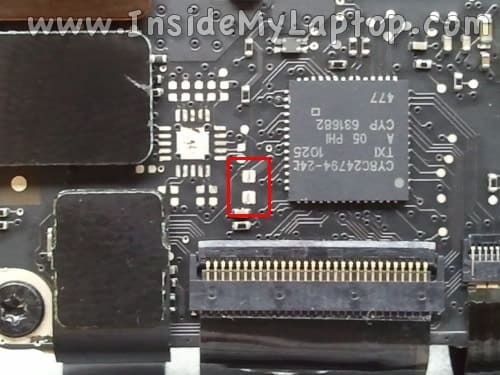 Remove the laptop palmrest assembly and locate the memory slot. There is a screw located close to the lower right corner of the memory slot. Right above the screw there should be two vertical square pads marked “PWR”. These are power-on pads on a MacBook Pro Early 2008. I have a Macbook Air 11″ Late 2011, and the logic board looks quite different from your photo of the Air 11″ 2010 model. You are correct. Your laptop has a different motherboard. At this time I cannot tell where power-on pads located. I’ll keep looking for the answer though. Let me know if you find them. Does it look like your motherboard? 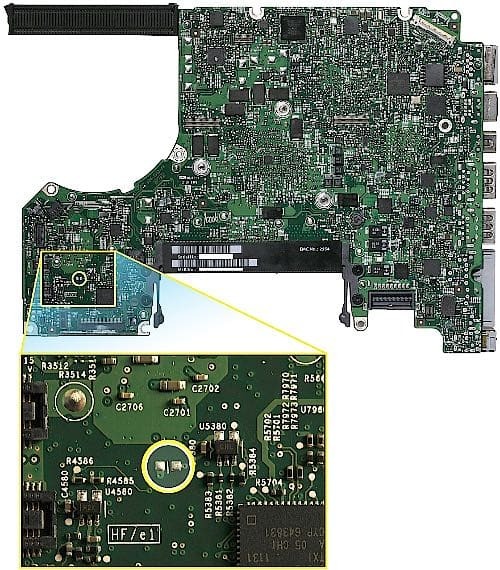 The Air 11″ 2011 motherboard looks very different from that photo. There are no pads anywhere near the keyboard connector. 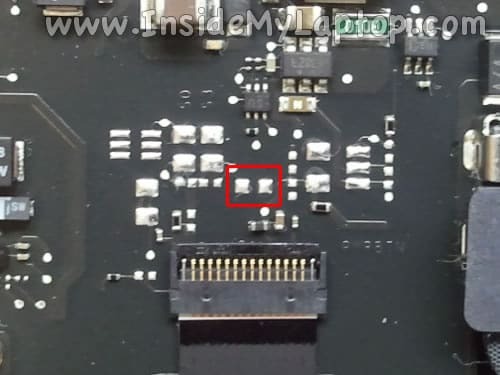 The area just above the keyboard connector has a large component and no solder pads. 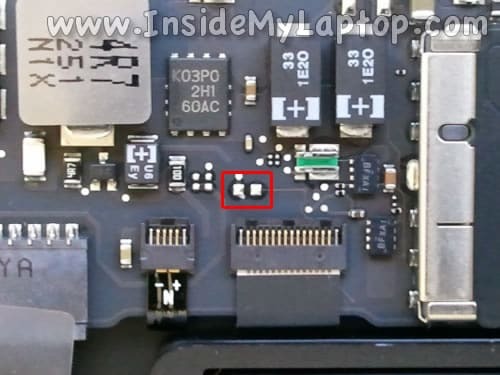 I see that the Macbook Pro 13″ 2011 has pads in a completely different place on the board (at the top). So I suspect the Air 11″ 2011 may also have pads in a different place. I will try to take a photo. 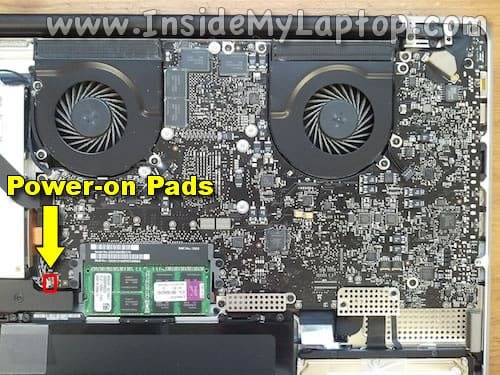 There are two pads at the lower left that look similar to the power pads on other boards. But I tried jumping those and it does not respond. 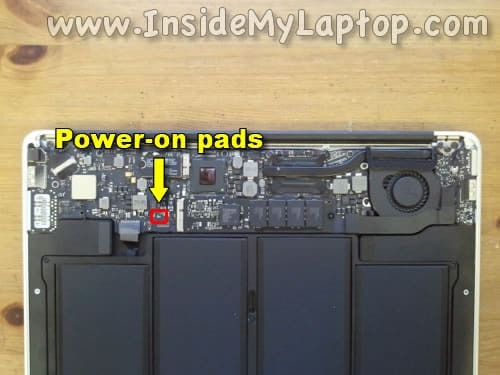 I still have not found the power-on pads on the 2011 Macbook Air 11″. However I was able to boot the logic board with these directions. I’ve located the power pads. FIrst time, it turned on, however it shut right off after about 5sec. Now it doesn’t turn on at all but I can hear it try to turn on but it gets shut off right away. Could be motherboard related issue. When you turn it on via power-on pads it should stay on. Just in case, try reseating memory modules. Try each memory module at a time. Maybe it’s memory related issue. 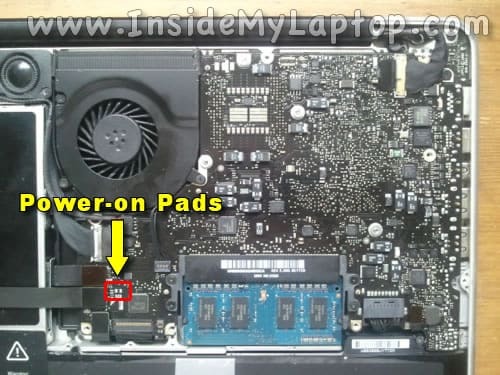 I was able to find the power pad and turn the machine on (Mac Book Pro 13 inch mid 2009). Unfortunately, the key board does not work. None of the keys pressed will work. Only the key pad and pointer works. Any suggestions would be greatly appreciated or sites that would help me replace the key board and power switch. absolutely fantastic! most comprehensive list i’ve ever seen! i’ve used the pin 5 to 29 short many times with my 2008 mac book pro while waiting for my replacement keyboard on a slow boat from china (took 7-8 weeks). Hi I have an A1211 MacBook Pro 17 inch from late 2006. Could you please tell me where the power on pads are on that model and how do you short pins? I do not understand what this means-Please help me. Amazing! I was in a panic after I realized that the power key died along with my keyboard which I accidentally busted…thank you so much!! I had this problem 2 weeks ago, I used this solution and it worked out all right. But today all of a sudden my macbook shutdown on its own and now no matter how many times I try to connect the pads it starts for a few seconds, i hear the chime but turns off right after. I checked my memories (If I understand correctly you mean RAM), but it didn’t change anything. I am taking it to service tomorrow but i don’t have a recent backup so I would really, really need to turn it on before leaving it to service. I forgot to say that the Apple Logo comes up with a spinning wheel below it, and I hear the chime and everything like they ‘re supposed to sound, and then all of a sudden shutdown. It’s hard to tell what’s going on without testing the laptop. It’s possible the hard drive is failing or file structure corrupted badly. What it you try turning it on with the hard drive disconnected? Will it stay on? Probably you can use an external USB enclosure to backup your files. It will work if the hard drive is still OK. You’ll need another Mac to backup files though. I tried to boot from the OSX Boot cd without the hard drive on and although it stayed on for longer, it crashed again after a while. I don’t think the drive is damaged because it worked fine and didn’t show any signs of corruption or any malfunction. It wasn’t even that packed, about 50% empty. The problem with the non working power button is connected with the logic board rather than the hard drive, right? I have Mountain Lion installed but the original boot cd has Leopard, as i downloaded the Mountain Lion update from the itunes store. Will it still work as a boot cd? Or should i download the file again from another Macbook and try to boot it with a usb stick? What are the steps that i should follow then? Thank you very much for your answer. I am pretty desperate to save my files and my laptop because buying a new one at the moment just isnt an option and the logic board replacement is way pricey for a 5 year old laptop. I’m afraid this sounds like a logic board failure. Just in case, try to reset NVRAM. As a last resort, you can remove the hard drive and install it into an external USB enclosure (available in local computer store). I tried to boot from the recovery disk in my hard drive and it got to the point where it would start downloading the OSX when it shut down. The same with the boot cd and without the hard drive on, it went up to the point where it would start the installation. At last i tried to boot with “t” pressed and hold down to boot in target disk mode and it worked! I got to the point where i typed my login password and as soon as my hopes began rising it shut down again. I repeated the whole procedure with the same results. Could it be that the small battery on the motherboard is running low? Thank you i follow your instructions and they have produced great results so far. Trying find/repair symptom of lots of vertical lines on Sony Vaio VGN-CR320 screen. Search of “vertical lines on screen” etc. in your search box yielded no results. Pictures of symptoms found, all show horizontal lines or fluid? in corners of screens, etc. Originally screen only showed lot of colored lines… Could tilt (like closing) and see screen sometimes. Now only white screen. Connect of external monitor shows nothing. 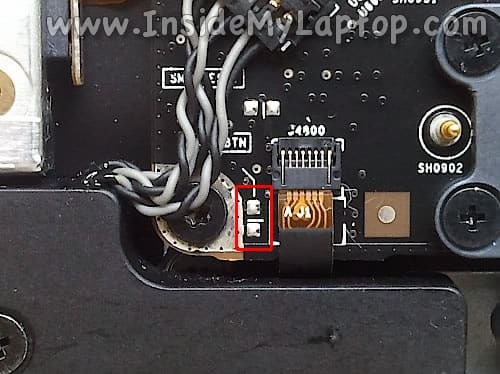 While disconnect of external monitor says “cable disconnected…”; so some type of a signal from laptop external monitor plug was present going to the monitor… What determines if video chip is bad or not? you should post the macbook a1181 pinout too. I have the picture but can’t attach it on your website. 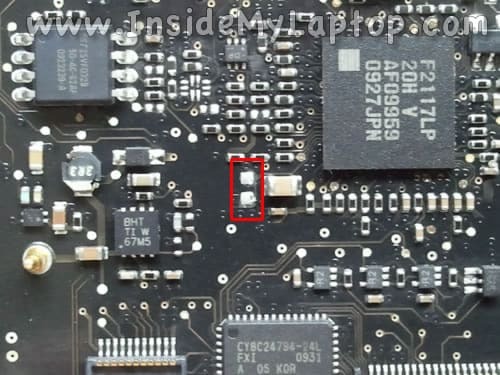 the power pin is the leftmost one on the bottom row on the logic board connector. I’d like to share my experience with you all in case it can help somebody else, I have a 15 inch late 2011 macbook, model number A1268, The inside looks exactly like the photo but when I crossed the power pads nothing happened, maybe I had to disconnect the keyboard first? idk. . Anyway what did work to turn it on was disconnecting the battery connector and replugging it in. 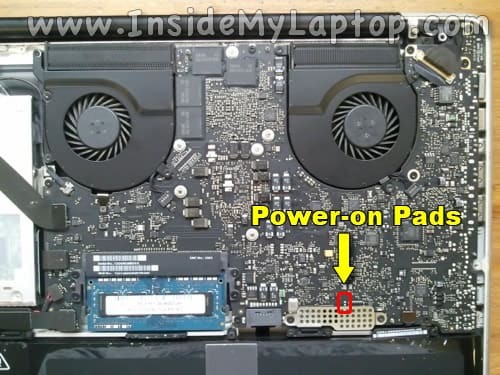 by any chance do you know where the power on pads are for the newest macbook pro 2013 A1398? Great source of info here! 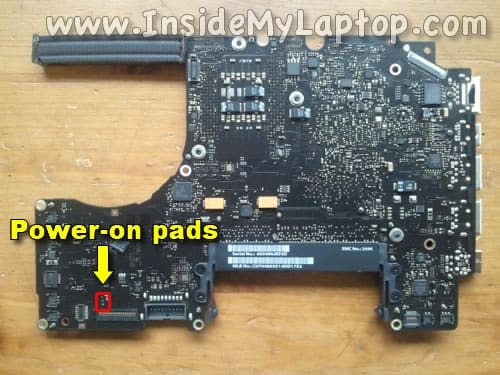 Would you have (or anyone else) the internal buttons for the MacBook Pro Retina 13″ 2012? I’ll be adding new models when I can access them. I have one here that belongs to a client that I need to test, can I help in ‘accessing one’ ? I don’t have it for MacBook Pro Retina 13″ 2012 yet. Just added two more pictures for a MacBook Pro (13-inch, Mid 2009) laptop. I just found this now… I’ll try tonight on my Macbook Pro I5 2.3GHZ…. I don’t know if it will solve my troubles, … but I’m sure it is a big nice work you’ve done ! I have a macbook pro (15 inch, mid 2009). I spilt water on my keyboard and the power button, now it won’t turn on. I have successfully located the keyboard connector. I tried to short it several times making sure I was exactly on the 5th pin from the left and the metal stud. I tried shorting with a paper clip, but nothing happened. Do I have to unplug the keyboard cable first? If so, how do I do that. Why isn’t it turning on? What do I have to do in order to turn on my macbook without the power button? Before you try turning it on, I would take a closer look at the motherboard, inspect it for liquid damage and clean up if necessary. I posted some tips for troubleshooting and cleaning laptops after liquid spill here. 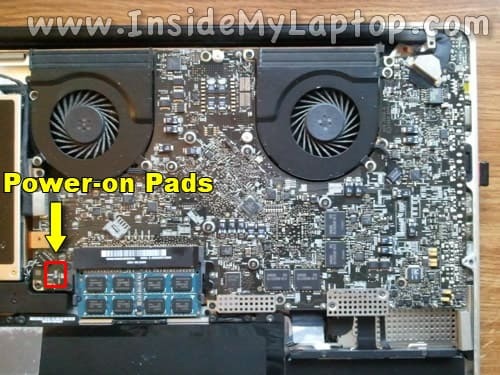 You’ll find compete MBP 15″ mid 2009 disassembly instructions here. Do I have to unplug the keyboard cable first? Yes, in some cases you have to do that. 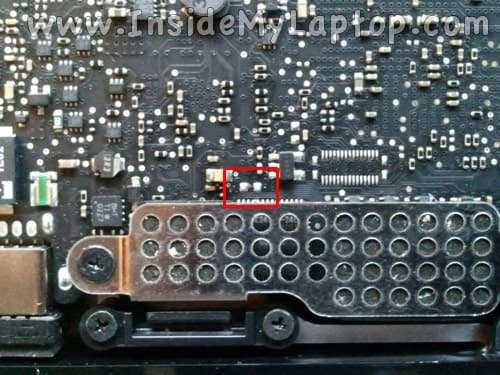 If the keyboard sorted badly, the laptop will turn on while it’s connected to the logic board. Wow – I stumbled on this by accident and what an amazing piece of work. I was asked to fix a family Macbook Pro (17 Inch Early Mid 2009). Coffee spill, took it apart and cleaned it all with Isopropyl Alchohol, one of the tiny screws in the keybord is stuck and will need to be drilled out?? Anyway once I put it all back together and it still did not work!!! Anyway I knew I had read about a power button work around and searched and found your page. When I shorted the power pads the fans can on – HOORAH but nothing else happened. I guess the slow speed is due to the Hard Drive and OS needing a damm good clean up?? Looks like a new keyboard will fix the beast after all – not looking forward to undoing and re-doing all those screws again. Do you have any tips of a stuck keyboard screw?? You can try using a small and sharp flathead screwdriver. You need a good one, something like Wiha brand. Push it into the stripped screws so the screwdrivers cuts into the metal a little bit. Try removing the screw while applying pressure on it. Maybe the screwdriver will engage with the screw this way. Also, heating up the screw a little bit (use small tip soldering gun) might help to melt the thread locker stuff (if there is any) and make it loose. 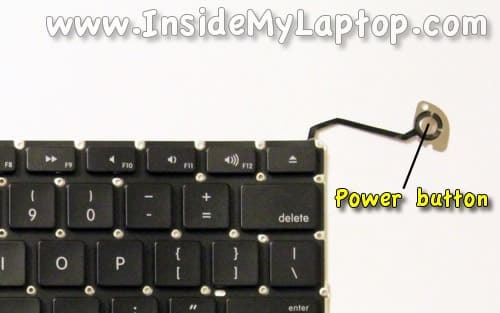 Before you replace the damaged keyboard, you can test the laptop with an external USB keyboard. Don’t forget to disconnect the internal one. Reseting PRAM might help to restore power settings to defaults. Turn on the laptop via power on pads and before it chimes press on Option+Command+P+R keys simultaneously. The laptop should turn on, show a white screen and restart. It’s possible but I cannot tell for sure without testing the laptop. Maybe reseting PRAM will help. 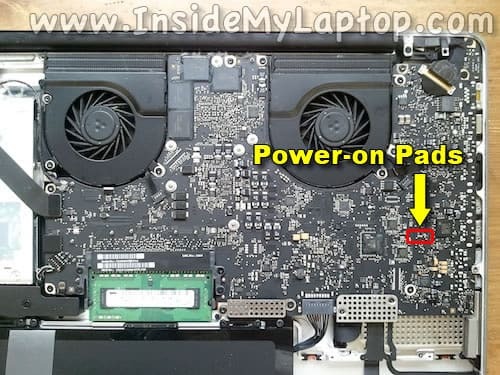 Almost 2 years later and still not pic of power pads on a 13-inch Mid 2012 MBP? If they are none does the 5th pin to post work on this model then? Do you know how to jump start the newest Macbook Air mid 13? Just added pads locations for MacBook Pro (Retina, 15-inch, Mid 2012) and MacBook Pro (Retina, 15-inch, Early 2013). I’ve been trying to find these pads myself but no luck so far. I’ll update the page if I find this information. Just added MacBook Pro (17-inch, Early-Late 2011). Just added MacBook Pro (17-inch, Mid 2010). How about Late 2013 MacBook Pro-retina? I would great appreciate your help! Thanks. can the button be repaired or replaced, with out changing everything. What causes the button to just stop working? The power button is a part of the keyboard. If the power button failed, the entire keyboard has to be replaced. Thank you so much for saving my macbook! So now I’ve turned it on and tested every single key on the keyboard. I found out that all keys are working only except for the power button. Is it necessary for me to replace the entire keyboard at this point? Or, can I just put it in sleep mode when needed, and never turn it off? Is that gonna do bad to the macbook? Again can’t say enough thanks !!!!!!!!!!!!!!!!!!!!!!! If you want to fix it properly, you’ll have to replace the keyboard. Here’s an example. Or, can I just put it in sleep mode when needed, and never turn it off? I never turn off mine. I use sleep mode all the time and if I have to reboot I do it though software. Hi! I recently spilled some water on my Macbook Pro 15″ (early 2011 model). I thoroughly went over the motherboard and all connections and made sure everything was dry with no corrosion. Try to turn it on but nothing happens. Afterwards I tried doing the short but nothing happens. Tried with and w/o the keyboard strip plugged in and also unplugging the battery to the board. The power plug light stays solid green and when I first plug it in the fans and front white light come on for about half a second then stop. I can’t think of anything else to try. Any suggestions? Heeelllppp meeee! I need to get back to Guild Wars! Hi there, any suggestions what I might do wrong if shorting the pads while the keyboard is disconnected doesnt work? I tried it several times with different screw drivers even 🙂 no lock.. power adapter is charging the battery, that ‘looks’ fine. i asked that question here and got this answer. but have not checked it on my laptop yet. I just would like to thank you for all the informations you put here. I have a MacBook Pro 13″ from 2012. I need to replace the keyboard as some keys are not working anymore. So i decided to order one and even 3 from Ebay. They all say that Keyboard for this model are the same than the model from 2011. Did someone already noticed this before? Should i try to switch the keyboard when the Mac is turned on to give it a try and then, do a PRAM if possible. Could it be possible that keyboards from model 2011 and 2012 have different wires schema? Where are the power On pads ?? thanx .. ..
points inside this Receptor plug success !!! .. ..
Can you use the same method to turn off the computer? I used your method to successfully turned on my A1398 with a dead power button, back in July. However today, the screen suddenly went black and I don’t know what to do. The fans are still running, and I can hear the computer make a sound when I press the enter key. Yes, you can use power pads to turn it off too. Also, you just disconnect the battery. First of all, try rebooting it. Maybe the video will come back. I fixed a 17 inch coffee spill Macbook and found the info here invaluable in identifying if it was worth saving. Now someone has recently knocked a mug if coffee on my Macbook 15 Inch Late 2008 Unibody. I cleaned it and managed to power on by shorting out the pins above but then the Macbook started to exhibit some star angle behaviour, it turned on by itself and then would not shutdown, well it did but it kept re-booting. Now it will not switch on at all using the ion shorted. Any idea what’s happened and is it repairable. Did a Motherboard re-flow and resolder of a couple resisters….Pressed power button and nothing; plugged in and booted right up but couldn’t turn off. Can’t thank you enough for having this! Saved me from a HUGE rabbit hole. New keyboard ordered and it’s like it never happened!! Thanks again for your time and effort on this particular topic. My wife’s white macbook (2009) experienced a slight beer spill while it was running. We cleaned it up and it continued to run for another hour then suddely turned off. So to me it seems there might be some issue with the power button, but it puzzles me that it works fine for turning it on…. 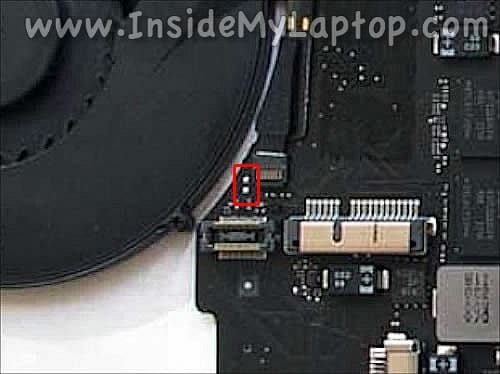 My mid 2010 macbook pro 15″ unibody’s power button will not turn my computer on when shut off. I had this issue along with a few keys on my keyboard not working so I replaced the keyboard, twice. All 3 keyboards in total had this power button issue for the past 2 weeks (after a water spill). If it is on, I can restart it like normal. I can also turn it off like normal through the apple drop down menu. If I press the power button to turn it off, that works too. But once it is off the power button does not seem to do anything. Trying to jump the computer as per the article above does nothing. When the problem initially started I found that unplugging the mag safe power cord then plugging it back in seemed to get the power button to turn the computer back on again. Now I’ve found in addition to unplugging the mag safe power cord I also have to remove the battery, then plug the battery back in, and finally plug the mag safe power back in. Strangely this process starts the computer the moment the mag safe is re-connected. This is regardless of rather the lid is open or closed. It has the same result without the battery inside, it just starts on its own. I can verify every key on the keyboard works correctly. The computer runs fine once turned on. I have reset the SMC and PRAM multiple times each. I have also run the Apple Hardware test disk a few times in simple and extensive testing mode. Does any of this ring any bells for anyone? Anyone have any advice or ideas? I have a MacBook Pro A1286, 15 inch, late 2008. The connector for the subwoofer fell off the logic board and needed to be resoldered on. Since then, the power button has not worked. I tried to short the power pads, but it did not turn the machine on. I then disconnected the keyboard ribbon and shorted the power pads and the machine started up as normal. I thus figured that the keyboard / power button was bad and replaced it. However, after finishing that, the power button still does not operate. I tried again to short the power pads and the machine starts up normally with the keyboard ribbon connected. I disconnected the subwoofer cable, but this does not help. Still no start with the power button, but it will start with a short to the power pads. Anything else I can try to figure out what is wrong with the power button? I posted the same questions but with photos on the ifixit website and got an answer. I also provided photos of the internals of my mid 2012 11″ macbook air. Feel free to use it on your website. 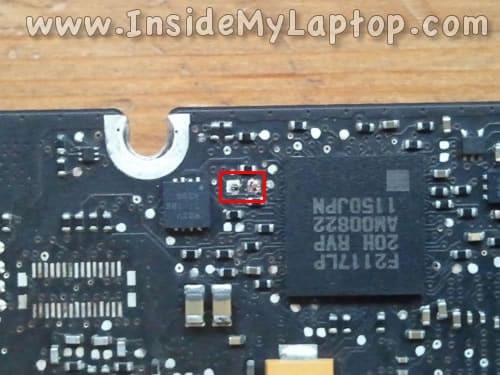 Apparently, the logic board was damaged by liquid. Did you inspect the logic board for any corrosion and try clean it up? Sorry cannot help. I don’t know where the pads are located on this model. Still trying to find. Tankyou for your great work. Do you know the power pads of macbook air 11″ early 2014? Do you know the power pads of macbook air 11″ early 2014? Not yet. I’m trying to obtain this info but no luck so far. Have you found them for a 2012 13″ macbook pro? On models with internal batteries, if you disconnect the battery, the computer turns on whenever you plug in the charger. You can short the bottom left pin on the A1181 top case connector to turn it on. You should also add the power pins for PCs. It’s a huge hassle to order a power button just to find out if the motherboard is good. 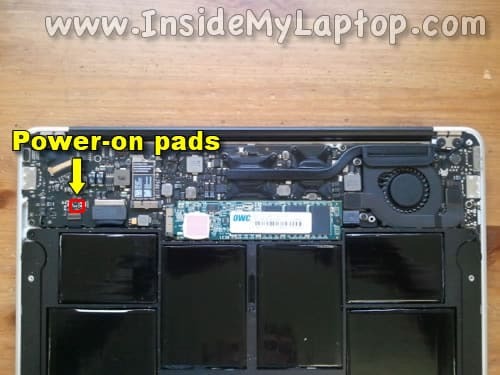 Are there pads for the 2008 NON unibody MacBook Pro 15 inch? 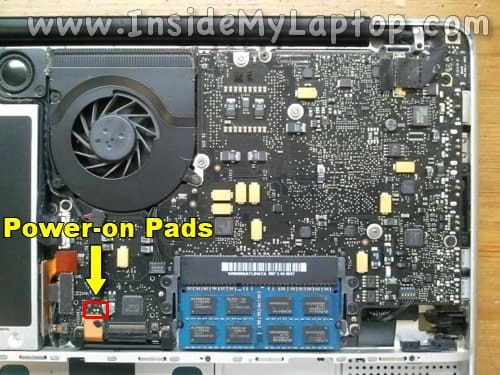 Hi, where can I find the power-on pads in a MacBook Air 11 (Model A1406)? Because Mmy model doesn’t match to any of those included in your post. Thanks in advance for your answer. Hi. I replaced my keyboard on a mbp mid 2009. i got it on ebay and they said it was a used tested keyboard but when i tried to turn it on nothing happened. before i started this it would turn on and i could use it with a usb keyboard. basically. what do you think i should try first. 1) put the old keyboard back in. or 2) try the power pads? before i started this it would turn on and i could use it with a usb keyboard. basically. what do you think i should try first. 1) put the old keyboard back in. or 2) try the power pads? 1. Try reconnecting the new keyboard. Maybe it’s just poor connection between the cable and logic board. 2. 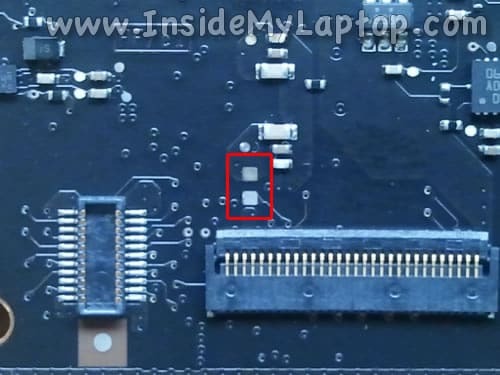 Disconnect the internal keyboard from the logic board. Try turning it on by shorting power on pads. If it turns on, test the laptop with an external USB keyboard and make sure everything works fine. 3. Try connecting the original keyboard. If the laptop turns on with the old keyboard but not the “new” one, probably you got a defective part. How ’bout the pad location for a late 2007 15″ 2.4gz a1226 ‘Santa Rosa’?? I’ve got a more in-depth question for ya, that I’ll ask at a later date. But the pad location is a good start for me, if you have that info for this model. -cool site. just stumbled across it tonite. 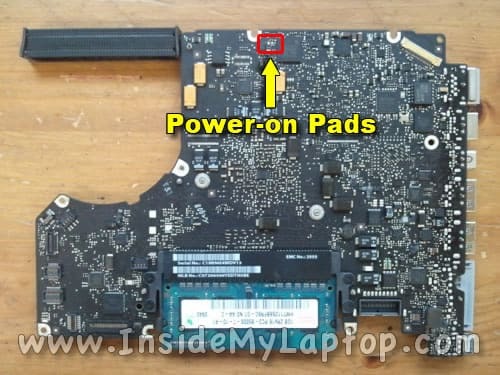 Hi, where can I find the power-on pads in a MacBook Pro Retina 13 2014 A1502 ? Hi! 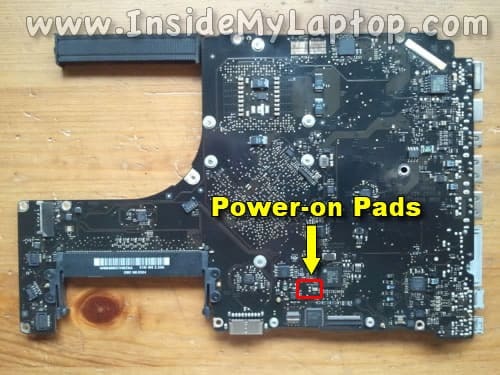 Help me find the power-on pads for macbook air 11″ a1370 2011.
my MBP unibody mid 2009 can’t be power up anymore. The macsafe adapter is working fine, it is still able to charge my battery, etc. I have tried all the tips such as SMC, PRMC reset etc but find it useless. The MBP won’t give anything out not a chime sound, blink, nothing at all. So is it possible the logic board got an issue? There is a power tripped before this thing happened and after that my MBP is dead. 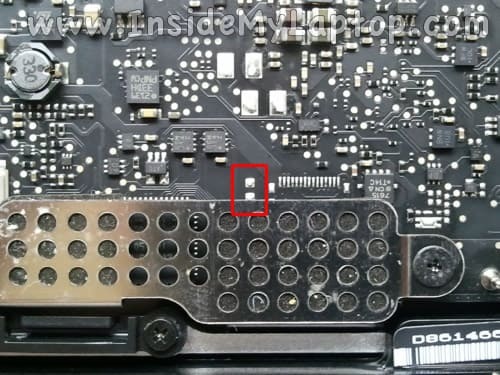 So is it possible that there is a power surge issue burning the logic board? thanks! your help is greatly appreciated! There are also two very tiny pads on the white (and black) polycarbonate (pre-Unibody) models. Hello, email me if you’d like to know where the pads are for the MacBook Pro 13 inch mid 2012. I have a nice image you can use, too. Thanks for the site, it gives me hope to get mine going. I have a MBP 15″ 12C60 I believe it was made in 2012 and is not a retina display. I don’t see a matching picture for my logic board but hopefully I can find one on the net. If you know where the power-on buttons are for mine I would greatly appreciate knowing. Thank you for all your work, time and effort to make others lives easier, peace out. Well it looks like the example for late 2011 was the same power-on pads as mine in 2012. I did get my fans to spin for a short while, then they died. The screen never came on and now the power cord does not show a connection and no charging light. Pretty sure I’m screwed. Again thanks for the site, really appreciated knowing how to attempt saving the macbook. Jason invited people to email him for the power on buttons for the macbook pro 13″ mid 2012. Would you please pass on this request to him? I just emailed him and asked for a picture. I will publish the picture when I receive it. I just added an image for MacBook Pro 13″ Mid 2012 laptop. Hi! I have a macbook Air 11″ Mid 2011 Model A1370 and i have located the power on pads on this model. Where can i send you the image? Also, with this MBA the power button suddenly stopped working and it does turn on with the power pads. What do you think it could be? Thanks! If the power button stopped working but the laptop turns on via power-on pads, most likely this is keyboard related failure. Was it liquid spill by any chance? You can try replacing the keyboard as I explained here. I would suggest testing the laptop with a new keyboard before actually installing keyboard (takes some time). It’s weird because it wasn’t liquid spill, it just stop working. Like I said, I was able to turn it on with the power on pads. All buttons and evrrything is working fibe except the power button. Hi. Excellent tutorial and information. Well done. However! For MBP 13, mid 2009, your comments and pictures are totally confusing. I think something went wrong in your posting there. You refer to two different types of logic board layouts, and show the pads in two different locations, BUT the logic boards are the same!! And the two sets of pads you refer to both exist on my version and in your pictures. So how to know which two pads to use when you refer to two different pairs for the same computer? Appreciate clarification. Don’t want to experiment with shorting circuits. Actually, I just posted something and now noticed an additional complication. I have an MBP 13 late-2009, but my logic board looks almost exactly like the picture you have of the late-2010. Meanwhile, aty the location where you show the power pads to be for late-2009, my logic board looks exactly like your pictures for the 2 different late-2009 versions. I guess this means that the late-2009 has at least one more layout, the one I have, which is a combination of the late 2009 and the late 2010. Question is, if I assume that since it looks exactly like your pictures for late 2009 if looking only directly around the supposed pads, then which of the two pairs you point to is the right one? Hey there…Many thanks, works for my MB Air 11′. 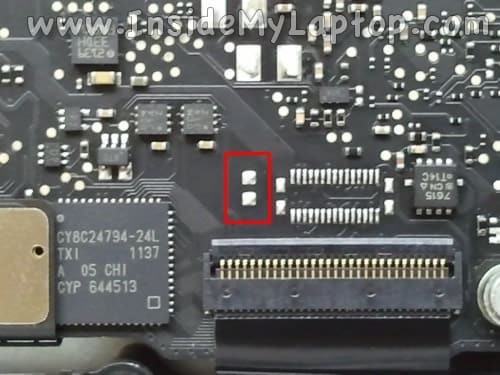 My MacBook Pro a1502 mid 2014 13.3′ retinal keyboard failed due to spill, can u please help me to locate power on pad. I swear there is no serial or model number on my MacBook. It’s a white unibody and from searching I think it’s an A1342 but there’s nothing, even tiny on the bottom. And of course it won’t boot so I’m trying to short the power button. Never mind found the sn inside in magic marker. It’s a late 2009 13″. What about Macbooks prior to the unibody models? My power cable was becoming increasingly testy until I noticed a frying on the jack side of the cable. After getting a new adaptor of the correct wattage the machine won’t turn on. I’ve taken the HD out, which is thankfully still in tact. Do I need to reinstall the hd for the power pads to be a diagnostic tool? I understand it won’t boot but I’m only looking to see if we get any kind of ignition! My data is safe so I’m hesitant to push my luck by putting the hd back in the machine. Hello, i’m trying to save a macbook 13 mid 2009 with a dead keyboard. It seems to have booted with the power pads but the screen doesn’t turn on. I don’t think i damaged the screen at any point or that i unplugged anything related. Is it a known issue with this method or did i screw up somewhere? Any clue would be appreciated. Thank you. Great !!! Worked for me, thanks a lot …. Hey, any ideas for the Macbook Pro Retina Display A1398 15” ? After I put it into sleep mode it wouldn’t turn on anymore, no chimes, no sounds or keyboard/apple lighting up. I tried the SMC reset, the PRAM reset, just holding the power button and I desperately need to access files on this laptop. Would appreciate some insight/help. Thanks! costs for someone at a retail repair shop? Wow I cannot thank you enough for writing this blog!! I had a minor liquid spill on my MBP, Mid-2012. After booting I found that all keys except few function keys and Power button are not working. Now I am using it without battery till I get my new keyboard. This may be a safer way to test functioning of MAC other than keyboard. I tried this manual and it did not work. I can see my battery has powee with the green lights on the side. Shorting the power solder parts did work. And what doesn’t help is that it is not made clear how to disconnect the keyboard. I’m looking for the pads for a macbook air 11″ mid 2011… Thx for your help. 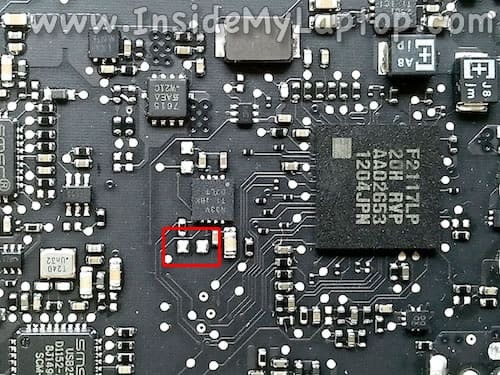 One of the power on pads of Macbookpro8.2 A1286 peeled away. How can I start now? 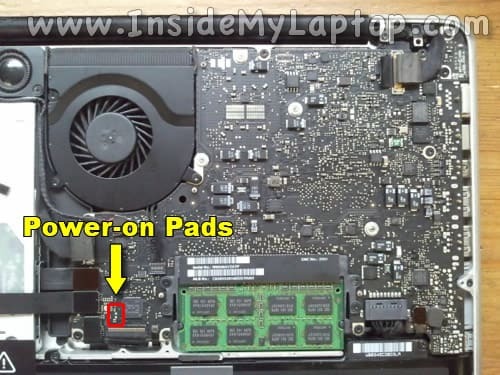 Will the removal of one of the pads affects the operation of the laptop? Hello! great guide! i need a little bit of help. i was able to turn the unit on. it eventually turned off and i ended up trying to do this method again. it turned on for a split second and then instantly died. i hit the battery power button to see if it had a charge, and the lights dont light up AT ALL now. nor does it light up when i plug the adapter into the wall. did i fry my laptop? or is it just a battery issue? or where should i start to start troubleshooting the problem. Ps i have a macbook pro 17″ A1297. 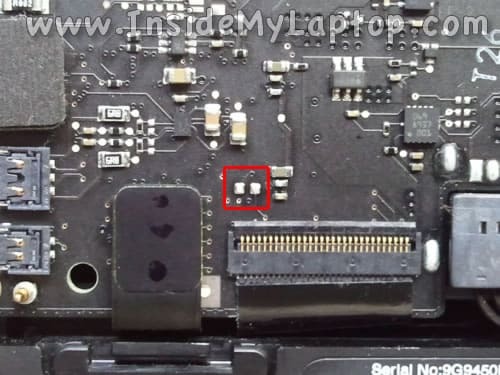 Where do the power button for the Retina late 2013 macbook pro model. Can’t find that no where. Help! Keyboard damage. where are the power pad’s on 17 inch early 2008? Thanks, worked like a charm on my 2009 15inch MBP 2.53. So does this mean I need to replace the keyboard to get the power button working again? Or, could it be anything else?